Search for a test using the search tool found at the top of the page. Note: The test search is for plain text only. Any HTML entered into the search field is stripped out of the search criteria. The HTML still displays in the Test Name of the test page. Click a letter in the menu. In the Results Found section, an alphabetical list of tests starting with the selected letter displays. Select the appropriate test from the Results Found list to view the test information. Select #0-9 to view all tests that begin with a number. Select ALLERGENS to view all the tests that begin with Allergen. Enter at least 3 characters of the Test Name or Number in the Search Box. Results will filter as you type. 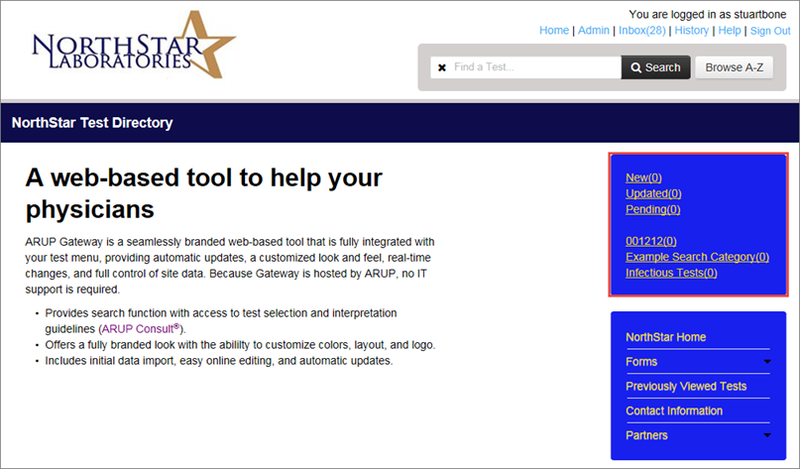 Click on the row for the appropriate test to view the test information. If no tests match your criteria, try a Full Search. Enter the Test Name or Number in the Search Box. The Results Found list appears for all the tests that match the name/number you entered. This list displays both the Test Name and Number. If you do not see your test, try changing your criteria to be more/less specific. Note that you must enter at least two numbers if searching by Test Number. Search for a test using one of the above methods (excluding Quick Search) and stop once you are on the Results Found page. Here you may search by Search Categories. Search Categories are displayed on the right side of the Results Found page. The number of tests contained in each category will be indicated by the number in parenthesis next to the category name. Click the category name from the Search Categories list. Note: To view this Laboratory Test Directory, you need Internet Explorer versions 8 through 11. Google Chrome is also supported. The optimal screen resolution setting is 1280x1060.